I've never done this before - given myself the gift of a marathon of this magnitude. Who has the time? But that was the gift of the flu. Facebook can make one feel left behind on certain things, and I had missed the whole Downton Abbey craze. On Sunday, people started posting about the beginning of Season 3. I asked Facebook: do I really have to watch from the beginning? The resounding answer was yes. My husband was watching a football game, so I took my computer under the covers and logged into Netflix and watched the first episode, and then the second. On Monday night I watched the next two episodes, but then I couldn't fall asleep, thinking about Anna and Bates, Mary and Matthew. Do I like Mary anyway, are we supposed to like her? And that Thomas! Tuesday morning I ran errands, but by 10:30am it was clear that I should not be driving, or writing, so I got back into bed and finished Season 1. But I had to have more! So I ended up paying for it, streaming on Amazon Prime. Two more. Sleep. Then yesterday I watched the next seven glorious episodes in Season 2, topping it off by watching Sunday night's movie-length episode on PBS.com. Never heard of Downton Abbey? Here is why it is so popular. 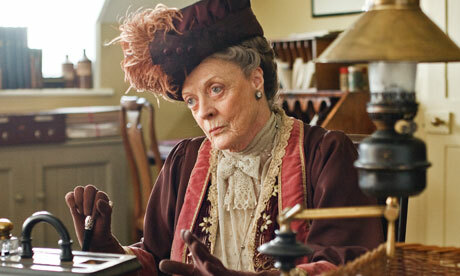 And who doesn't love Maggie Smith? I don't care for Mary, but I know someone who relates to her well. She's just one of those characters--like Scarlet in Gone With the Wind--who is polarizing. I saw some of your post, you are the doing the awesome job. Do you also accept guest post? I am wondering if you accept then I would like to share some blogging tools with you. Great Post. Thanks alot for sharing this post. Unknown Sources Must be transformed wallinside.com/ on to Install as well as Run Game Killer. you Official Website could turn on this feature from your Official Game Killer Free Download on Android Android Device App Settings. It makes Game Killer it possible for Game Killer Game Killer App application to set up on your Android Device. While not as preferred as splashthat.com/ several of the other designs on our checklist, the X3 has actually obtained Website beautiful reviews from those that Best Jogging Stoller in June 2017 have acquired it. Thanks for sharing this article really nice . Norton Antivirus is anti- malware software that protects data and privacy as computer security products. Identifying viruses, e-mail spam filtering and phishing protection are its various features that are necessary to stay safe in today's world of cyber threats. This anti-virus, anti-malware, and anti-spyware scans and removes malwares, is designed to protect smartphones from data theft or loss, multi-features, protects privacy, protects against malicious apps, and saves from phishing and intrusive behavior. After reading this article only one words came from my mind that is "wow". This article has really helps me to increase my knowledge. So thank for sharing such a wonderful article. Belkin setup are giving a proper guidence how to fix your Gadgets Security. All Visiter Share This Post Cool Post"
This Is Good Post For Everyone.And Very Helpfully. Any Virus Problem Visit There.."
credit card terminal Our customized online Payment Gateway Solutions and Electronic Payment Solutions can help create innovation in sales techniques. As a result, it is an easier user experience for your customers.